Even the cafe terraces are deserted from the wind and rain. We'll call upon St. Genvieve to vanquish the storms. The Experienced Travelers like to think we can cope. 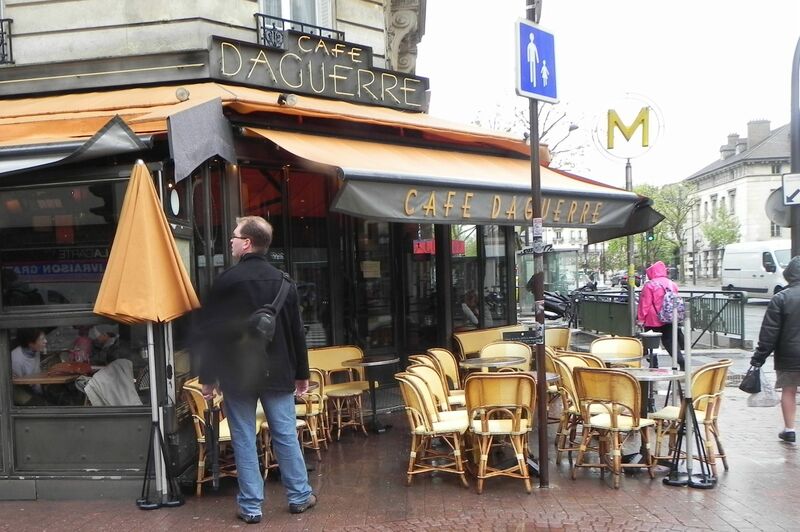 But today, the driving wind and rain in Paris made us long for a cozy table in a warm corner with an attentive waiter. We’ve never had such inclement weather. It’s a wet, bone-chilling cold that sent us puddle-jumping from café crème to chocolat chaud to stay dry in between errands. 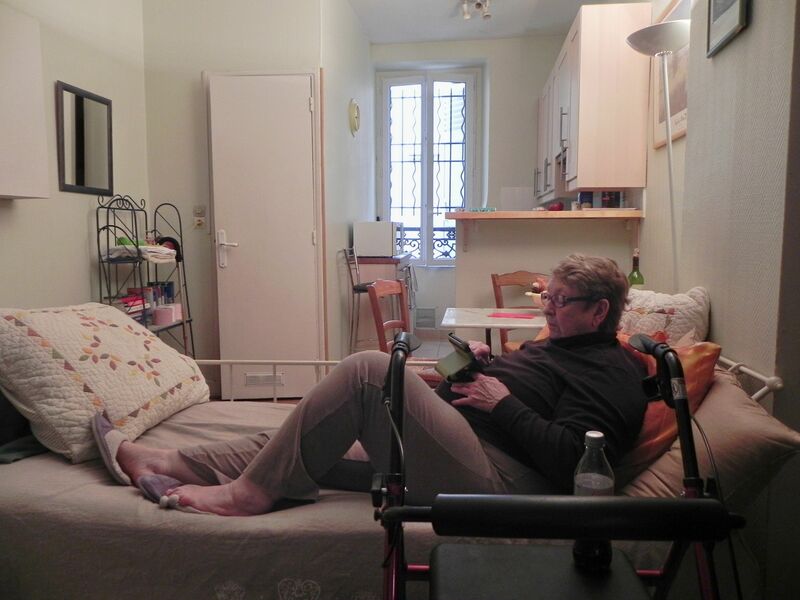 Our studio apartment bears no resemblance to the palatial embassies nearby, but it’s comfortable and the ground floor location is ideal for Nurse’s bad knee. While her “hotwheels” do double-duty as a bedside table, they got me into a bit of trouble with a stern Train Man on the TGV to Paris from Rennes, but that’s another story. 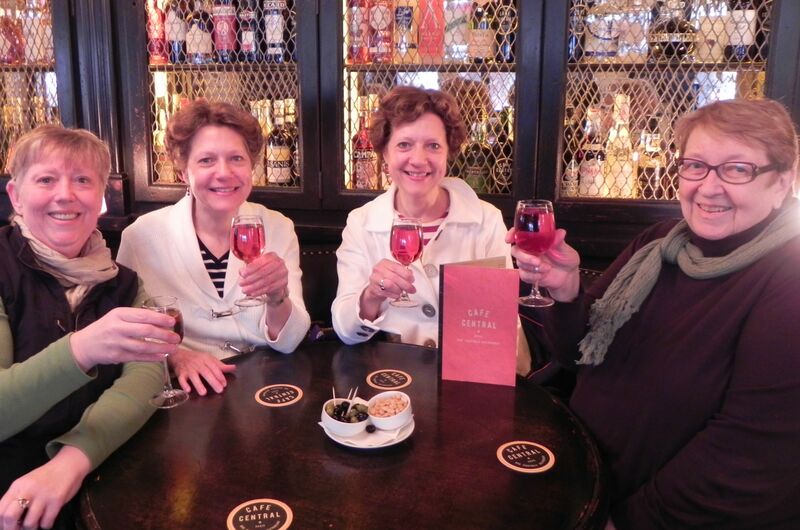 Julie, Barbara, Christine and Nurse expand their appreciation of fine wine and French culture. Our friends Barbara and Christine arrived this morning and it didn’t take them long to get their priorities in order – errands, food shopping then some well-deserved refreshment to build fortitude for more shopping. Barbara and Chris working their way up to more well-earned refreshment and a better understanding of French vintages. 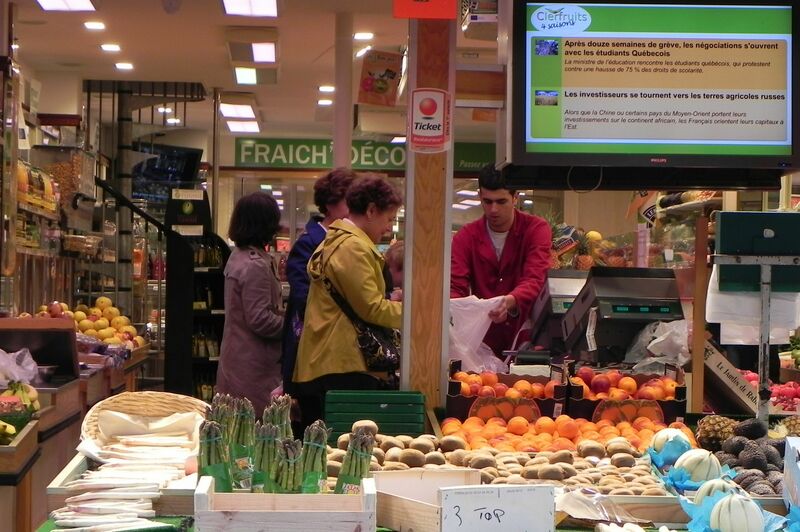 To ease our jetlagged Associate ETs into Paris time, we composed an early dinner from the bounteous fare in the market – white asparagus, fingerling potatoes, shallots and three outstanding deserts. For the main course, the delightful man behind the counter directed the full, unequivocal force of his French charm at Barbara and promptly sold us a most excellent roast chicken. It just goes to show that flirtation pays! This entry was posted on April 25, 2012 at 4:19 pm and is filed under Uncategorized. You can follow any responses to this entry through the RSS 2.0 feed. You can leave a response, or trackback from your own site. T&V it’s teeming with handsome Frenchmen and they’re ever so friendly. Indeed they are! We are off to see Soeur Madeleine Sophie today. Really, she is here. Today looks clear. Hope the worst has passed. We think of the Stateside Pets every time we see a black dog or an adventurous orange cat. “The sun will come out tomorrow, tomorrow, tomorrow…” Hope the weather improves for you! Paris and Rochester must be sister weather cities! Amazing how often the weather is the same. Ah Miss J the weather yes, but if only the food were the same too….